Pronunciation: noun To say or speak correctly, especially a language. American English Pronunciation: noun The accent used predominantly within the United States of America. American English pronunciation is the accent used in Hollywood representing the general American accent and by news casters from CNN etcetera as the American accent. Welcome to the American English Pronunciation area of our online Article library. Pronunciation is an important part of speaking English and learning English. By simply learning how to make the sounds within American English and learning how to recognize these sounds, your pronunciation and speaking will improve. 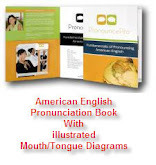 Pronounce Pro publishes a DVD and CD partner method for American English pronunciation which easily and expertly instructs good pronunciation. Here you can find free lessons and tips to improve pronunciation. For further free instruction, videos, lessons, quizzes on Pronunciation visit the Pronunciation area of the Online English hub. Remember if you have questions about Pronunciation you can ask the Online English Hub’s Teacher Staff for free with the Online English Learning Tree. Learn Pronunciation with our American English Pronunciation Online Quiz and Answer Library located on this blog. Have fun with the resources and lots of learning to you!